This is the cutest baby shower gift, ever! Meyamo gives onesies– umm, I mean snap-bottomed tee shirts that may or may not be affiliated with the Gerber brand– a cool DIY twist. A soft white cotton snap tee with contrast edging in your choice of boyish blue, princessy pink or gender-neutral green comes in a sweet little organza pouch that also contains two sheets of adorable fuzzy iron-on alphabet letters. 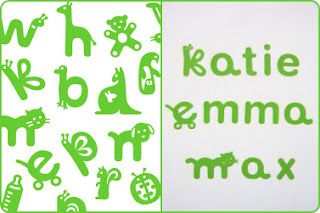 Some of them are plain lower case letters but others have morphed into cute little animals or symbols, waiting for you to choose the perfect name or phrase for your little munchkin. I got a set for Jasper but ended up with enough letters left over to embellish a shirt for big sister Roo, too. These are very cute! Do you have one? The last two pics are our attempts. The onesie with the green trim came with the set and the plain white toddler tee is one of our old ones.